Home » General Health » Beeturia: How Long Does It Last? Red urine often rings warning bells of a dangerous infection lurking in our body, such as with gross hematuria. But today, we are focusing on a less serious condition known as beeturia. It should not be ignored as it may be a sign you have an iron deficiency. You may have already guessed that beeturia involves the root vegetables beets and your urine. We know that some foods will change the color of our urine and stools, but they don’t usually have their own medical terminology. So, why does the term beeturia exist and how long do beets stay in your urine? Let’s uncover the mystery behind the beet-red urine. What Is Beeturia? How Long Does It Last? As the name suggests, beeturia refers to red urine produced by the digestion of food or drink containing beetroot as a primary ingredient. This includes consuming beetroot extract and pigments. The discoloration of the urine is due to betalain, a red glyosidic dye found in beets. One of the two categories of betalain that is responsible for the reddish coloring of beets is referred to as betacyanin. It can vary in shades of redness relating to the amount of betanin ingested. So, how long does beeturia last? Fortunately, it typically takes up to only 48 hours for the betanin to leave your system. It really depends on how much of the pigmentation you ingest and how long your body takes to digest. This does not happen to everyone nor does it happen every time you eat beets. In fact, this only covers 10% to 14% of all beet eaters. Next, we will discover why this happens. We can credit the digestion, or lack thereof, of the beet pigment betacyanin for the presence of beeturia. Upon consumption of such pigment, our body works to properly digest it, but there may have a problem due to two main beeturia causes. We require a certain amount of stomach acid for many digestive roles, including processing proteins. A less acidic environment prohibits the stomach from breaking down the betacyanin properly. It is then distributed through the digestive system and lands in the bloodstream to be filtered in the kidneys. The result is red urine. A deficiency in iron creates absorption problems within the gastrointestinal tract system. This malabsorption can lead to the secretion of the red dye of beets in urine. With an iron deficiency, beeturia may be accompanied by pale skin, anemia, constant fatigue, and concentration problems. Because iron deficiency is such a critical health condition, it is important to understand the importance of iron in preventing beeturia. We require sufficient iron levels to produce the protein called hemoglobin. This promotes the delivery of oxygen by red blood cells, which in turn allows for the proper digestion and absorption of nutrients. An iron deficiency may be first noticed by symptoms of difficulty in concentrating, sight of pale gums and skin, and an overwhelming feeling of exhaustion. By increasing iron intake through your diet, your energy levels will return and you may be able to enjoy beets without any after effects. Beeturia is a condition that can be easily treated and normally causes no symptoms other than the red color in urine. The red tinge can, however, be the first indicator of another heath condition, possibly with the kidneys. Therefore, it is important to have tests done to confirm beeturia. If there is improper absorption of betacyanin, you may have a medical history of malabsorption of other substances. Symptoms may include past problems with gas, bloating, constipation, and frequent bulky stools. Most will associate the red tint in the urine with blood from a detrimental disorder. A urine test will confirm or rule out the presence of any red blood cells. As there are other mild and more serious health conditions that can present red urine, it is vital to undergo laboratory and clinical tests. 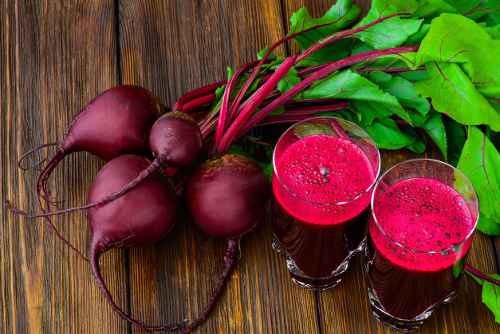 To distinguish whether your red urine is from improper digestion of beets or contains blood as a result of a underlying condition, you can expect several medical tests. Laboratory tests performed may include a complete blood count check for any low levels of red blood cells that would indicate anemia or hematuria. A urinary test would determine if any red blood cells are present as well as check the kidney function by the presence of blood urea nitrogen (BUN) and creatinine. In some cases, a stool sample is taken for examination of any blood presence. A diagnostic ultrasound scan may also be done to ensure the kidneys are functioning properly. Beeturia is a mild health condition that usually dissipates over time. This certainly does not make it any less alarming upon seeing the first signs of red urine. The varying shades of red coloring in the urine is dependent on the beetroot itself as well as internal factors such as stomach acid. Other health conditions can preset red urine as an early indicator and this is why it is crucial to know if beeturia is the cause. A confirmed diagnosis will also determine if you need to increase the level of stomach acid or iron levels. Take heed if your urine has a reddish hue. “Beeturia,” Revolvy; https://www.revolvy.com/topic/Beeturia&item_type=topic, last accessed June 1, 2017.